The Butcher, The Baker and The Candlestickmaker (well the Tallow Chandlers really). I completed the trio of invites, during my year, by lunching and breaking bread with the Bakers this month (each livery company has its own traditions). The feasting continued with a very enjoyable dinner with the Brewers and finally I was honoured to be invited to the Mercers for dinner. It is a chance to see some increasingly familiar faces of Masters of other livery companies. I flew up to Glasgow for the Institute of Brewing and Distilling awards night for their Scottish Section. The Worshipful Company of Distillers prize for the highest mark in the Diploma distilling paper 2 went to Jennifer Turkington of Diageo. The principal speaker was one of my heroes – the Scottish & British Lions Rugby player Doddie Weir. Doddie is fighting motor neuron disease but is in great spirits and raising awareness about the disease. It was very special to have a chance to chat to him. I thought the City Debate was another great success. The topic of “family against publicly controlled companies” produced some lively debating. I was not surprised when the majority vote for family before the debate was reduced in the vote after the debate with a great speech from Colin Gordon. The format of the evening seems to work well with plenty of chance for chatting after the debate both for liverymen and City people. I was invited to the Annual Dinner of the Gin Guild at Guildhall with another raft of installations of members, many from overseas. Nick Cook and the Board of the Gin Guild have a great deal of momentum at present, mirroring the gin boom. On another evening we were able to thank Honorary Assistant Chris Parker by giving him a dinner following his retirement from the Industry Committee. We will not however be losing all his insight into the drinks industry as he remains on the Court. 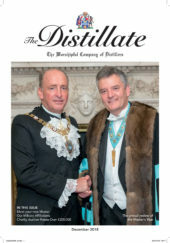 It is a small world and there have been some very interesting crossovers between my roles as Master Distiller and also High Sheriff of Essex. It began with a service at St. Pauls Cathedral for the Sons of the Clergy. Many Masters process in to the Cathedral. It amused me that one of the three choirs was from Chelmsford Cathedral and they sang Stanford’s “Blessed are the undefiled,” which is one of the anthems I have already asked them to sing this October for the High Sheriff’s Justice Service in Chelmsford Cathedral. Then I was invited to the House of Lords for a lunch for the Onside Youth Zone in Dagenham, the charity project that our charity auction supported. The building is going up fast and the catchment area will spread into Essex. Finally all the High Sheriffs of England & Wales were invited to a reception at the Old Bailey by the Sheriffs of the City of London. It was a great chance to catch up with many familiar faces from both the City and the Shrievalty.